Today (December 6) is the day in 1273 when Thomas Aquinas stopped writing. He had certainly written plenty by then. He was not yet fifty years old, but had written about a hundred works: Commentaries on Scripture, collections of patristic commentaries, sermons, philosophical treatises, explorations of disputed subjects, commentaries on Aristotle and Proclus and Boethius, and a couple of Summas. Ah, the Summas, there’s the rub. Thomas was not done writing his Summa Theologiae, his definitive work. (Usage note: Folks call him Thomas because he’s first-name famous like Bono, and his last name just means “from Aquino.” And the big Summa used to get called Theologica, but is now usually, and more correctly, referred to as the harder-to-spell but shorter-to-say Theologiae.) The great Summa breaks off unfinished. To round off the fragment, Thomas’ friend Reginald of Piperno pulled together sections from an earlier theological treatise (Thomas’ commentary on Lombard’s Sentences), and appended it to the Summa as The Supplement. excited by an extraordinary alteration, and after that Mass never wrote or dictated anything; indeed, he hung up his instruments of writing in the third part of the Summa, in the treatise on penance. It would obviously be wrong to picture Aquinas as changing his mind about the content of anything he had written. And there may be a mundane reason for Thomas to have stopped producing, related to whatever medical condition ended his life within the year. The best medical guess is some kind of stroke. But if Reginald’s story is accurate and relevant, it may also be that having written with exquisite clarity for many years, Thomas received a visionary moment of clarity, and saw the object of his theological reasoning in a way that made further writing inadequate. Once, at the beginning of his Opusculum De Creaturis Spiritualibus, Thomas had given a rough reason of why theologians do what they do: “Not being able to do the work of the angels in choir, we can at least write about them.” As he drew near to the destiny of doing the work of the angels gathered around God, perhaps the task of writing out theology, which was always a kind of compensation anyway, became less urgent. 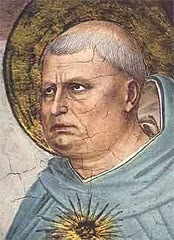 Thomas Aquinas stopped writing today, considering all his writing as so much straw. Those of us who soldier on with the task of theology recognize that it is a pretty admirable pile of straw, by just about any theological standard you want to apply. But if you have the choice between reading the Summa and joining in the praise of God more directly, choose the latter. Thomas did.